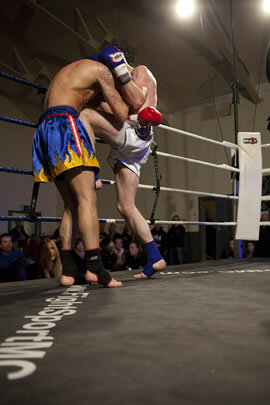 Muay Thai Boxing club based in Glasgow's Westend. The aim of the Academy is to make Thai Boxing as accessible as possible for as many people as possible. Thai Boxing has been refined and defined from the ancient art of Muay Thai also known as The Science of Eight Limbs because we use our hands, feet, knees and elbows to defend ourselves. Thai Boxing is not only a formidable form of self defence it is also a whole body workout suitable for both male and female alike and also one of the most exciting, full contact, ring sports around. We make no secret of the fact that we are in essence in a community-based club for the local community but this hasn't stopped welcoming students from not only all over Glasgow but indeed from all over the world. All classes are held in our recently refurbished gym which has a boxing ring, large selection of equipment including pads, bags & kick shields, free weights, selection of kettlebells and extensive matted areas. We welcome students from other martial arts and currently have students of Karate, Tae Kwon Do, Kung Fu, boxing and Ju-Jitsu training with us. We train from complete novices through to champion fighters, so whether you fancy being a world champion or you just want a safe fun way of stress busting while becoming fitter and leaner, why not pop down to try a class & become part of Team GTBA?